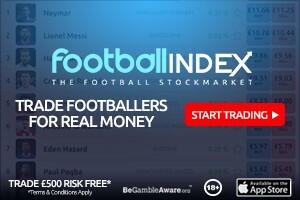 Here’s our GW8 fantasy football tips article where Andrew Ferguson reviews his GW7 teams in FPL, TFF, Sky and Sun and outlines his plans for GW8. Andrew finished top 1k in TFF, Sky and FPL plus 15k in Sun in 17/18. A very average week with me being stung for not going in on Kane and Hazard. 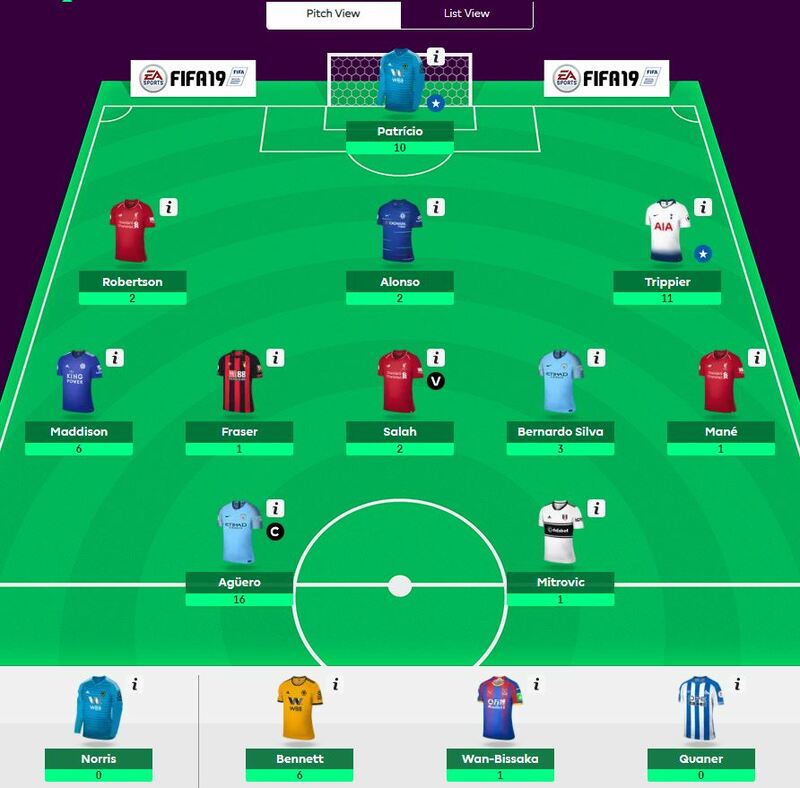 My transfer of Mendy to Trippier paid off and Aguero, Maddison and Patricio brought home some points with the rest failing to deliver resulting in my first red arrow of the season. My reluctance to shift my team about too much and stick with Liverpool will result in weeks like this although I finished above the average so it’s not a disaster. I have pondered a lot this week and have decided not to risk it and will be getting Kane in for a hit for Aguero by also getting Gudmundsson in for Bernardo subject to the pressers. I usually wouldn’t however I now plan to wildcard over the international break with a view to getting Aguero back in for Kane, getting Hazard in and sorting out the rest of my team. 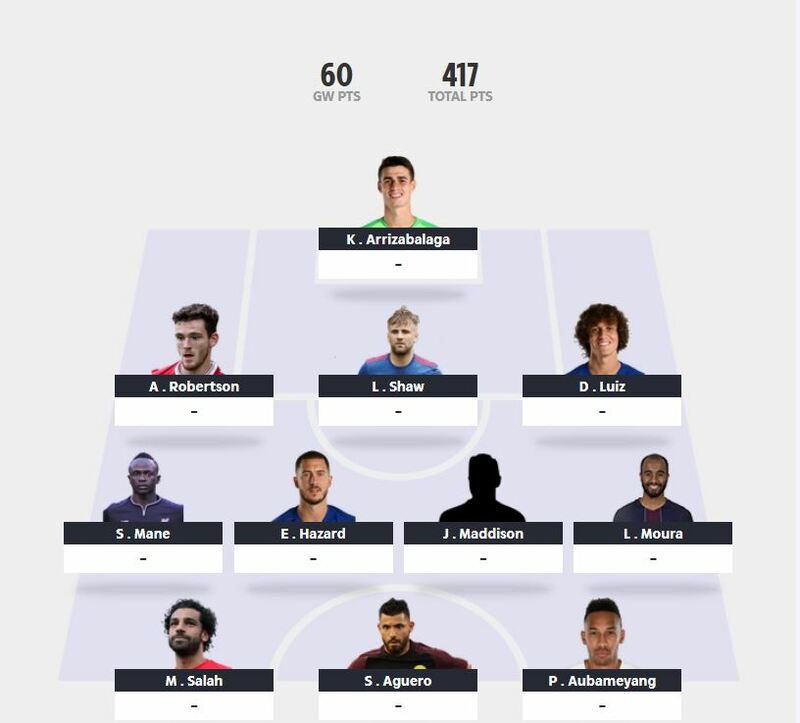 My feeling is that if I can get to the GW8 international break in the top 10k and with a fresh wildcard team in hand it puts me in a very strong position going into the Autumn/Winter run in. My team has gone a little stale and players like Hazard and Doherty are killing me every week at the moment whilst I also want to get in players like Arnautovic and Alexander Arnold for a potential Liverpool double defence with Robertson with their fixtures. Palace and Bournemouth’s fixtures turn nasty soon so all round it looks like the right move. This week I will be benching Norris, Bennett, Fraser and Quaner. My captain will be Kane and is purely a defensive move to hopefully get me safely to wildcard in a strong position. A low scoring week for me with Liverpool not getting much although their fixtures improve from now on. Aguero and Maddison were again in the points and Moura got another 2nd KC but not much else from elsewhere. The Palace boys saved my week on Monday night giving me a respectable but under-par score. 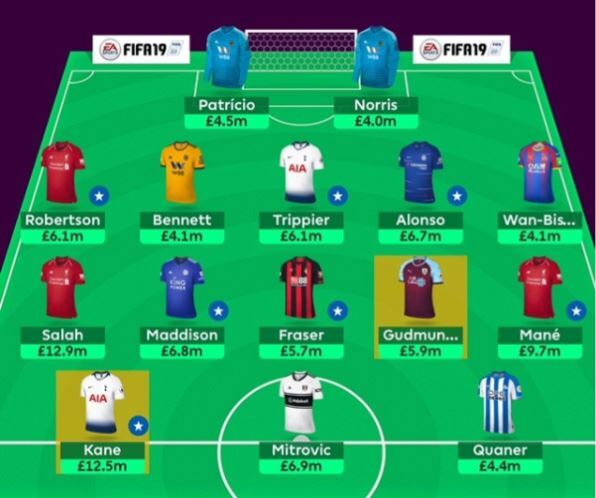 I won’t be making any transfers now until after the international break where I will reset and look at rejigging to bring in Hazard and maybe Sterling and Arnautovic somehow! Not a bad week with a small increase in overall rank, my only increase over the four formats. My defence delivered aside from Robertson who has a great run coming up and only Seri didn’t deliver from the midfield and attack. I was tempted by Gudmundsson for the Sunday captain but didn’t go through with it unfortunately. I will look to bring in Kane for Zaha for the Saturday captaincy as my final transfer before the international break. Laporte is killing it every week and I will be looking to bring him in probably for Trippier after the international break. I am also looking at how to bring Arnautovic and Sterling around the same time. My captains will be Ryan on Friday, Kane on Saturday then Hazard on Sunday. Not having Kane was a rank killer this week but I will be addressing this next week with the Champions League also in mind. Hazard, Aguero and Maddison delivered again with the European games a little disappointing this week aside from a couple of clean sheets. I will be looking at how to get Kane in with Aubameyang the natural fall guy so will need around 1m from another transfer to top up the money in the bank. I am also now looking at Laporte to get some Man City defensive cover in and maybe Alexander Arnold after the international break due to his good price. Good luck everyone for GW8! Interested as to why you are starting Mitrovic ahead of Fraser? I have both plus Wilson and was thinking double Bournemouth with Mitrovic benched. What do you think? Whats is ur team value now and how much ITB? You give your weekly score and overall rank. Could you give your overall score as well. So I can see how many points behind I am and therefore see how quickly or slowly I can climb the ranks. How can you afford to bring in Kane for zaha in the Sky sports team? 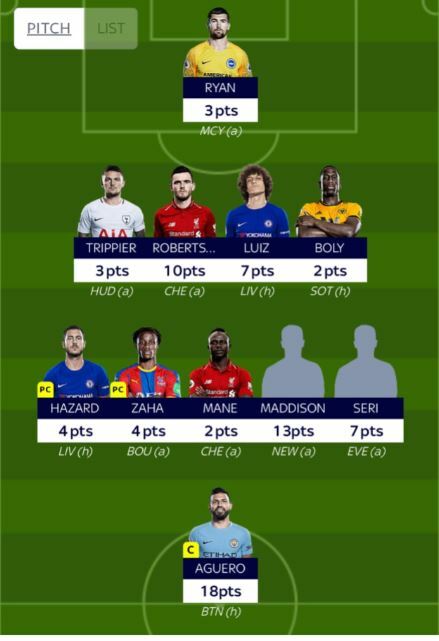 You posted your Salah wildcard team today on twitter, in an earlier post saying you might like to get in Mendy. I’m thinking Sterling might be a good substitute for Aguero, even with rotation last year he walloped Aguero in points per £ (using this year’s £, of course). Originally I had pegged Aguero as better, he said he plays better since his knee surgery, but now, even after rest during the international break, his small injury is a worry. The £0.2 lower cost for Sterling might be important to bring in Mendy. In the Sterling for Aguero swap, Ings or Jimenez would be the swap, either could perform as well as Fraser, who with his knock is the drop to bring in Sterling. Also, there is an argument to be made to bring in Kamara. Yes, it weakens the bench, but puts all your money in your starting IX. And Kamara not playing isn’t an issue, it’s rare to need your last outfield bench player. The money could be used to upgrade to Mendy, if a small 0.1 or 0.2 is needed even after the Aguero to Sterling swap. And there is plenty more £ available to upgrade Duffy to Alexander Arnold (if you want those favorable Liverpool fixtures, compared to the nightmare Frasier, Ings or even Jimenez face from GW 12 to 16) or Luiz to Alonso. I’m in a similar situation, so your thoughts would be greatly appreciated. I have a similar team. Wondering if I ought to do this change. 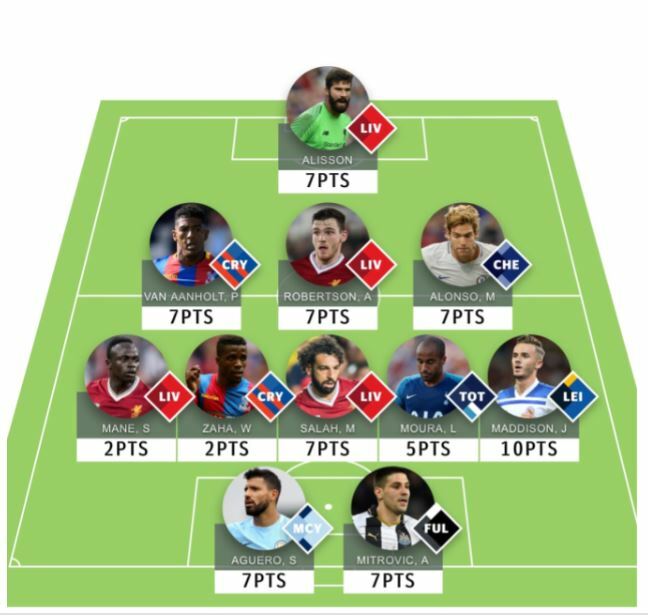 On your latest wildcard, 9 hours ago, with Mendy, you can strengthen Duffy to TAA by switching Aguero to Kamara and Hojberg to Sterling. Sterling’s underlying stats are great, no lingering injury risk like Aguero. The swap frees up 0.7£, which can be used to upgrade Duffy to TAA (or do another trade if you want). Bench becomes TAA or Doherty, Billings and Kamara instead of Duffy, Billings and Hojberg. Yes the last spot (Kamara) is weak, but how often is it needed? The benefit of TAA vs Duffy is real.